Can anyone who is in the US give us any updates? What's going on? What's the progress of the special investigation? Any new leads? Is trump being pressured? What's the latest news and what's going on? Its dead and going nowhere but that does not stop the democrats from performing cpr on it. Now the liberals have realized that it will go nowhere they have now pursue another route via the 25th amendment. But that too will go nowhere. Now the media is focused on how trump laugh and shakes putins hands. Like a laughter or a handshake will somehow bring down Trump. Reality is trump is here to stay for the next 4 years. That's the cold hard truth. Its to early to count your chicken ps. The special investigation aren't done yet from what I hear. Dude it ain't counting its a fact! The so called hack has never been Proven. Almost 9 months and so definite evidence have been put up. Obama's Mr.Clapper admit under oath that they have no evidence of Trump or Russia collusion, to back that up Obama's own FBI appointee Comey also said the same thing under oath too. You can never hack the voting machines. They are not connected to the world wide web/internet. Lets say for a second that's its true which is ain't it means someone under Russian controlled had ro remotely infect the voting machines manually and there are millions of those voting machines. If its also true then the electoral college which gave trump the white house are under Russian control too. Hillary lost because of 4 states which she never campaigned at. The whole hacking is not about the voting or how Russia hacked the voting slots is about the DNC files that got hacked and were given to Wikileaks which then dump the files in the world wide web for the world to see how corrupt the DNC was and is. The DNC is like the club house for the Democrats. It was these DNC servers that got hacked not the voting slots themselves. The media is saying the voting slots but the actual hack was at the DNC a couple months before the elections of 2017. So how does that contribute to your present situation in the FSM? Can you share for inquiring minds want to know. PawnStar is a classic example of what happens to someone who has been brainwashed by Zionist propaganda. This is probably the only place on Earth where this pathetic fool can easily voice his Zionist leaning opinions without receiving instantaneous negative feedback in the form of a punch or a bitchslap. Although he is a nuisance, just boycott his comments, and do not respond to them. I think that is how they deal with online trolls like this. May his soul boil in human feces forever and ever amen. My goodness you people. You<he. @Spiritallyinsane what does this has anything to do with this? @pawnstar that is yet to be Proven. You ever wonder why factsmatter stop posting? Is because he or she has accepted the inevitable conclusion that Trump is here to stay. Also remember that when he post stories that are negative towards trump he always leave out the source. The source to all his stories are CNN=Clinton News Network. All these Russians BS started because of that. Couple days ago CNN fired 3 of its journalists when it turned out their story regarding Trumps campaign manager never met nor took money from Russia like CNN wrote. *After the election, the media pushed out the story that Russia had stolen the election for President Trump. One newspaper claimed Russia had hacked the American power grid. That story had to be retracted. On February 14, 2017, the New York Times ran a story claiming "[p]hone records and intercepted calls show that members of Donald J. Trump's 2016 presidential campaign and other Trump associates had repeated contacts with senior Russian intelligence officials in the year before the election, according to four current and former American officials." James Comey, testifying under oath before the United States Senate, said that story was not true. *CNN ran a story claiming James Comey would dispute the president's assertion that Comey had told the president he was not under investigation. CNN had to retract that story after James Comey corroborated the president's statement. Then CNN ran a story claiming a friend of the president's had nefarious dealings with a Russian investment group. That story had to be retracted as well. *In February, the Associated Press ran a story that President Trump intended to mobilize the National Guard to round up illegal aliens. The story was not true, but just about every major media outlet ran with it. In May, the media claimed the GOP had trucked in beer to congress to celebrate repealing Obamacare. That was not true either. It turns out the beer wholesalers were having a party on Capitol Hill. *Let's not forget the media claiming James Comey was fired shortly after asking for an increase in funding for the investigation into Russia. The acting director of the FBI said that story was not true. The mainstream media in America in general is controlled by democrats. All the top executives of ABC news, MSNBC,CNN and the rest had connection to the Obama administration. Some of these executives were married to people in Obama's inner administration circle. Look it up its public record. Search media executives married to Obama administration and you will get over thousands of hits. The media not all but all the established ones like the ones I mention made contributions to Hillary Clinton election campaign. When Obama was in charge not one single bad story was aired. And when it did they made it like it wasn't his fault. The news media of now is political and controlled and biased and slanted towards the liberal democrats. The Russians have RT News in America the Democrats have CNN, MSNBC,ABC,Google,Motherjones,Vibes,MTV,Washington Posts,Yahoo etc etc etc. Even Facebook! Like I said before, you are seeing a classic example of what it looks like when someone has been brainwashed by Zionist propaganda. Almost seems like Pawnstar is a paid Zionist propagandist assigned to this forum. What is "Zionist propaganda"; and why blame PS of it? Do you believe that half of all Americans--who are supportive of President Trump--are doing so because of the Zionist propaganda? One can disagree with PS for his political belief but blaming the Zionist propaganda is a cheap shot; and is, in fact, an easy way to blame others with the same argument that the Nazi's made against Jewish population that led to their millions of being exterminated. So my request is to keep the discussion focus on the real US politics and stay away from insensitive comments to incite with unfounded accusations. Pawnstar is expressing his opinion as he has the right to. It's my understanding that he is a US vet. If so, he has all the rights and privileges to speak--against or for--any subject relative to the US and the US government. Like other Micronesian US vets, he had earned that right by having served. As for us in Micronesia, we enjoy our freedom as well as the financial support from the US. We also have learned that we can participate with the political discourse--whether in the US or in our respective islands. Personally, I like the US to be strong militarily as well as economically; to stand genuinely against N. Korea; and be supportive of Japan and S. Korea; and be firm with China in this side of the world stage. These, it is my hope, will lead to a more stable world--a world troubled resulting from many "inaction" by the previous US President. Just some thoughts. What is a Zionist or brainwashed Zionist? Spirituallyinsane is a clonset racist. Anti semite or people who hates Jews and Israel. All because they believe the Jews control the world. This believe was starter by Hitler and propagated by communist Russia. If Jews run the world then you will also believe that Santa and the Easter bunny are part of that clique too. Sadly this is what liberal democrats believe too. Are you a Zionist agent? It seems very strange and unusual for Micronesian men to openly discuss how much they love another man in a public forum. In Micronesian culture, it is generally considered unmanly to openly display acts of affection for others regardless of them being male or female. What is more shocking in this case is that PawnStar and Trump are both males. So although most of us Micronesians on this forum view this as something really strange and unusual, for the foreigners, it is considered normal and some of them even encourage it. Finally, my message to PawnStar is thank you for your service, but please do not taint the legacy of your military career by being too GAY about all things TRUMP. BIG BROTHER IS ALWAYS WATCHING. You mistook support for love. Love is what you liberals have for the last guy even if he lied to bring change. I support trump because he is the better alternative then lying Hillary. NO need to be shy about your LOVE and SUPPORT for TRUMP. Its ok we totally understand. Support is similar to Love. They're both interchangeable and one cannot exist without the other. But no need to be shy and secretive about your MANLY LOVE FOR TRUMP. My god can't believe we went down this route? If so then yeah! Whatever float your boat there homie. 66 Million of us support and love him. So what are you're thoughts on the recent story about Donald Trump Jr emails which he and a Russian lawyer are talking about Hillary related matarials? Its a big nothing sandwich like the ones before. Remember the source of the story is the new York post. One of the big five names in the media along with CNN, ABC, NBC and MSNBC that threw in their fortune with the democrats and tried hard to get Hillary elected. Not to mention it also made money donations to Hillary's campaign. And another thing is its not illegal if its true which I doubt it since the lawyer admitted that nothing ever came from it nor was any data shared between them. The media is just trying really hard to portray negativity towards the Trump administration. Not one single mention of Trump 500,000 jobs growth or Trump and republicans trying to save a dying baby in England or Trump administration giving 50 million to fund women entrepreneurs. This is nothing and will also be nothing. In federal law, "collusion" is not a crime, of course . Only actual crimes bring indictments. As we know, there have already been many indictments, guilty pleas, and sentences imposed. And there will be more as multiple investigations - federal, state, and congressional - continue. Stay tuned. Trump has been vindicated! There was no Collusion! Mueller has no sealed indictments and HAS reccomended NO MORE indictments! 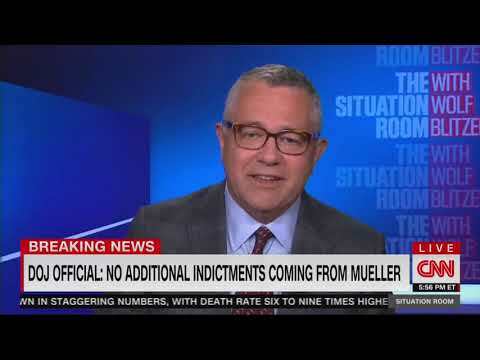 A video from CNN and their expert commentator says it all: The indication that no more indictments are coming from Mueller is a WIN for Trump. @FactsMatters said: " In federal law, "collusion" is not a crime, of course . Only actual crimes bring indictments". Wonderful now that you have return to reality my friend @FactsMatters. For 2 years you have said that collusion is a crime now you admit that it isn't. What changed? Oh yeah no one has been charged with Collusion to sway to election towards Trump in 2016. It must be some bitter pill to swallow. lol...Repeat after me my friend: No indictments coming nor were the indictments by Mueller linked to the Russian investigation to find if anyone cooperated with Russia in 2016. @FactsMatters said: " As we know, there have already been many indictments, guilty pleas, and sentences imposed". Yes, many have been indicted but not for the reason of the investigation which is To find out if anyone from the Trump campaign colluded with Russia to interfere in the election of 2016, and no one has been indicted for that! All the indictments are for lying to a federal agent.